This past week was Hunger and Homelessness Week at Campbell University. There were many different events designed to raise awareness for the homeless. On Tuesday at 1:30, a documentary was shown in Turner Auditorium. It was called A Place to Call Home and was made by Rebecca Kenyon, who is from the United Kingdom. Ms. Kenyon has family in Wilmington and that is where the documentary was filmed. A Place to Call Home followed the lives of several homeless people and also people who work to help the homeless. One man was named Vince and at the beginning of the film he lived under some stairs in a parking garage. He, along with another character, Jerome, would volunteer at places like churches, or helping clean up the city in order to hopefully receive a job out of it. Jerome lived under a bridge at the beginning but was forced to move to the woods so people would not see him. He also attended Cape Fear Community College, but had to drop out due to failing grades. This leaves a question worth thinking about: Are there people in your class here at Campbell who may be going through something similar? Or how would you cope with the stress of school without having a place to call your own. 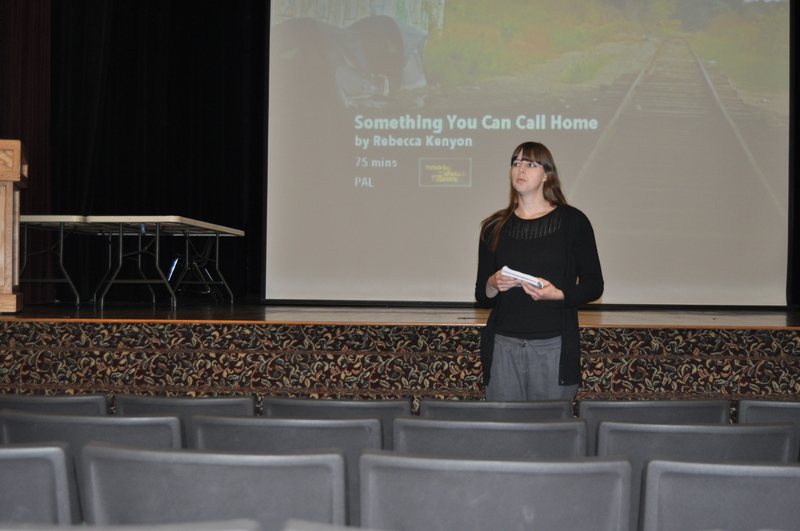 This is a picture of Rebecca as she discusses the film with students after the viewing.